One of the things that often comes up as a whisky fan is the combination of whisky and a cigar. ‘Brandy and cigars’ is a stock phrase to talk of the end of an evening but it in recent times the the strength of flavour of robust whiskies seems to be the choice of the cigar smoker. As a Christmas present to myself this year I bought myself a small humidor and a sampler pack of sticks (as I do believe the vernacular goes) in an attempt to educate myself in the way of tobacco, but after getting myself a bit ripped off I decided to speak to an expert and see what they recommended for a second selection. One of the creams of this new crop of cigars was a Trinidad Coloniales. The story I was told matches up with a lot of what is said online – this was Fidel Castro’s private cigar brand for many years, only leaving Cuba as presents to foreign diplomats, until 1998 when they released the Fundadores, the founder, a single size of cigar for export. 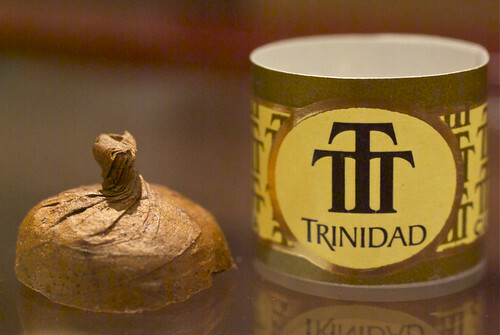 Elsewhere the tale is that Trinidad was an inferior blend of tobacco to the Cohibas that were more famously Castro’s to give, but as with much in the Cuban cigar world it is all about the stories. Over the years the range has expanded and the nice chap at Davidoff recommended one to me as part of a selection of medium to full-bodied cigars. The cigar looks really good, with a twisted end (rather than the usual smooth cap), and a fairly smooth wrapper, although with more thick veins than with many of the cigars I’ve tried. At 5.1 inches and a ring gauge of 44 it’s a bit thicker and longer than the petit coronas I’ve been trying up until now, but it was recommended that I try some longer cigars as the extra length gives more time for the flavours to develop – in other words, more tobacco for the smoke to build up in and flavour. It started off quite lightly flavoured and remarkably creamy, a term I’d read in reviews and didn’t really understand until trying this one, with some sweet wood and a “milky coffee” softened bitterness. As expected the flavour changed through the cigar, adding more woody spice, losing some of the cream and bringing in some almost menthol flavours on the palate after exhaling. I decided, having read the comments about the Coloniales’s creaminess, to try and pair it with something creamy and dug around in the cupboard to discover that I didn’t have anything particularly suitable. I turned to the random miniatures shelf and chose The Glenlivet 15 year old French Oak Reserve, acquired in a goody bag from Caskstrength.net‘s The Glenlivet tasting at Boisdale’s last year – quite apropos as that was the night I had my first cigar in years and decided to start investigating. On its own the whisky has a nose of sweet fruit, waxy grain and vanilla (as one would expect from a whisky finished in Limousin oak barrels) and a creamy taste which follows the nose, with fruit and vanilla rolling into a finish of granny smith apples and dry brown cardboard (in a good way). Water kept the cream intact but soured things up, with the fruit turning to unripe grapes and the granny smiths coming through more strongly, although with a vanilla cream coating. With the cigar a lot of the trademark The Glenlivet creaminess blended in with the cream of the smoke, and the combined flavours were spicy cinnamon, clove, vanilla and a tiny bit of menthol, as well as woody marzipan with a pleasantly metallic tang on the finish. The cigar burned well, only going out as it started on the last third (in part due to me being distracted by the whisky) and as it had started to get a bit more full bodied (although still very much a medium cigar) I decided to switch up a notch to the Laphroaig 12 year old Cask Strength Batch 002. I ordered this one on my birthday, as the Laphroaig website offers the Friends of Laphroaig (let me know if you want to join and I’ll fill in the form to get you a miniature sent out for sampling) a further discount on that day, and grabbed a couple of bottles as the batch 2 was coming to a close and has since been replaced by a new batch 003. 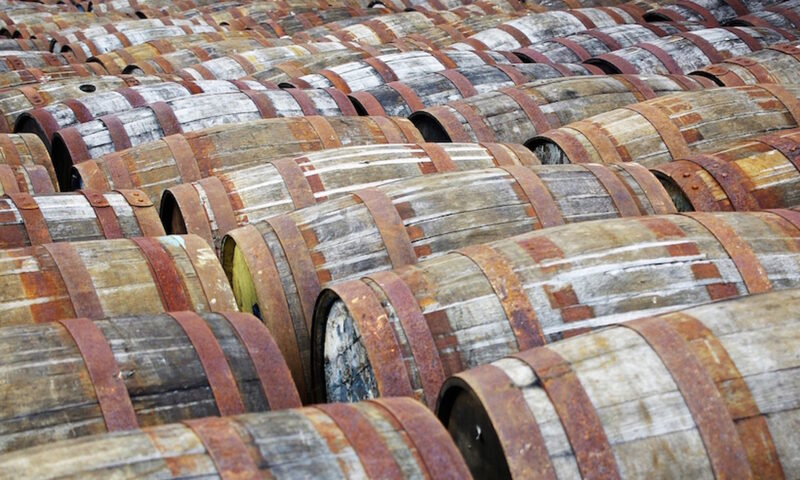 On its own the whisky has a nose of meaty peat, cut with a drop of the Laphroaig’s normal TCP, and some sweet fruitiness underneath – sharp grapes and maybe some bananas? To taste it was heavily minerally, with gravel and granite, and peaty (as expected) with a big slab of lemon, milk chocolate and a sherberty tingle. Water took the edge off the boozey bite and brought out more chocolate, as well as some raisin sweetness – rum and raisin Dairy Milk by a peat fire? The cigar picked up more woody aromas as well as more prickly spices and dark chocolate and kept the smoke’s creamy mouthfeel, but the whisky contrasted rather than complimented. The fruit of the nose was swamped by the wood, leaving a burst of ripe grape, but the stony peat lingered on the finish with an apple skin bitterness and cask strength booze hit. A bit too much for the cigar, but a rather nice whisky. I need to do more work on matching flavours, but both whiskies held up to the, admittedly not particularly overpowering, flavour of the cigar, with the overlapping tastes reinforcing and the contrasts standing out against each other in differing levels of successfulness. My humidor is almost bare, which I was told (in a ‘useful for sales’ but still true kind of way) is a problem due to the difficulty of maintaining the correct humidity in an empty box, and I will shortly be obtaining some more cigars for my occasional forays into smoking – I may have to pick up a few Trinidads as an occasional treat. Speyside single malt Scotch whisky, 40%. ~£30. Islay single malt cask strength Scotch whisky, 58.3%. 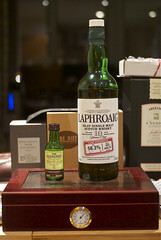 ~£30 on your birthday from the Laphroaig site when it was available. ~£40 from elsewhere. Cuban corona cigar, 5.1 inches, 44 ring gauge.~£12.